The Pulse: Copa Airlines has begun nonstop service four times a week from its Hub of the Americas at Tocumen International Airport in Panama to Fort Lauderdale, Fla.
Copa Airlines, a subsidiary of Copa Holdings, S.A., and a member of Star Alliance, has begun nonstop service four times a week from its Hub of the Americas at Tocumen International Airport in Panama to Fort Lauderdale, Fla., the airline’s fourth destination in Florida, its 10th in the U.S., and its 67th destination overall. 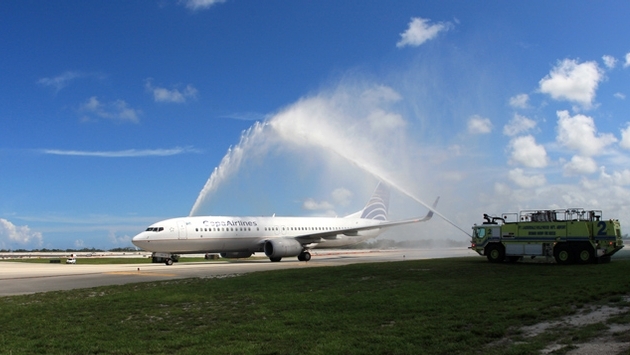 “Our new flight from Fort Lauderdale-Hollywood International Airport expands travel opportunities for business passengers, vacationers and families to Panama and to more destinations throughout Latin America than ever before,” said Joe Mohan, senior vice president, commercial and planning, Copa Airlines. Broward County aviation officials estimate that passengers made over 128,000 round-trip flights from Fort Lauderdale-Hollywood International Airport to Latin American destinations in 2013. Copa’s new nonstop Fort Lauderdale-Panama flight increases connectivity to more than 55 business and leisure destinations throughout Latin America and the Caribbean. From Panama, Copa flies to more international destinations than any other airline from any other hub in Latin America. The airline is operating the flight to Panama with a Boeing 737-700 Next Generation with 12 business class seats and 112 economy seats. Copa flight 266 departs Fort Lauderdale on Mondays, Wednesdays, Fridays and Saturdays at 5:44 p.m., arriving at Copa’s Hub of the Americas at 8:23 p.m. Flight 265 will depart Panama at 11:46 a.m. the same days of the week, arriving at 3:49 p.m.
Copa’s on-board service includes complimentary meals and beverages, including wines and spirits; a 12-channel audio-visual entertainment system in English, Spanish and Portuguese, with new movies monthly and complimentary headsets. Flight attendants are bilingual. Passengers may earn miles through the MileagePlus frequent-flyer program. Copa’s website, copa.com, is available in English, Spanish and Portuguese; passengers may purchase tickets in U.S. dollars, as well as seven other currencies. In-transit passengers making connections do not have immigration/customs waits and baggage is checked to the final destination. Copa has now become Florida’s premiere transportation connection to Latin America, offering direct nonstop service between Panama and four Florida destinations – Fort Lauderdale, Miami, Orlando and Tampa – more than any other Latin American airline.